You require the highlighted section. Cut and paste it into a handy spot or write it down if you prefer the old fashioned way - you will need it for step 2. Did you make a note of the location of those files you uploaded? Good, you're ready to fill out the form that will generate your decoration code. Read the instructions carefully and fill in the fields as required. If you have difficulty click on the button for extra advice. This home has no background images or colors. This home has just a body background. This home has just a table background. This home has both body and table backgrounds. Profile pages are a little different ... here are the same four combinations used on a profile page. This profile has no background images or colors. This profile has just a body background. This profile has just a table background. This profile has both body and table backgrounds. Background images appear over the top of background colors. Backgrounds can be fixed - that means that when you scroll down the screen the background remains in the same place. Check the box to fix your background in place. Colors should be either color names or hexidecimal values - for example: black or #000000. Click on the question mark next to the color options for a color chart. You have a wide variety of options available to you for adjusting the appearance of your text. The image below demonstrates which areas of text this section of the form deals with. Fonts are tricky! If you are using a non-standard font not everyone will be able to see it. You might like to specify an alternative, and you can do that by separating a list of fonts by comma - eg Lithos Pro, Arial, san-serif. Click the help button next to the font family text box for some common font-family combinations. Choose a size which is appropriate for all the fonts you have listed. Sizes are in points, so open up your favourite word processing program to judge relative sizes. Heading tags affect particular parts of text on Pan homes. 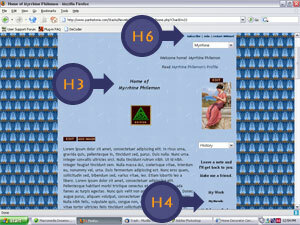 There are six heading tags, but only the H3, H4 and H6 tags are a significant part of your home's template. There is some coding in place in the template which will continue to affect the way your heading tags work. Links have a series of "states" they go through. 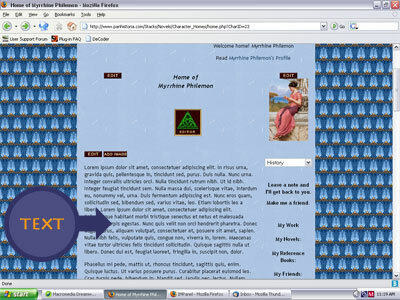 A:link shows that there is link on the page. A:visited shows that the link has already been clicked or visited. A:hover occurs when the mouse is hovering over a link, before it is clicked. A:active happens when a link is clicked, or if you have a framed page when the link is displayed inside one of the frames. Each of these states will have their own line in your style sheet. Links are underlined by default - to turn off underlining you must choose none.